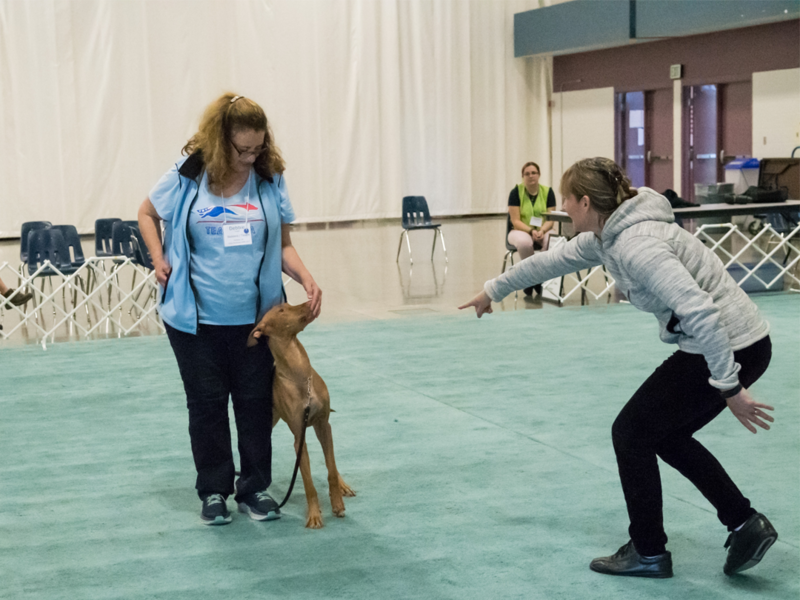 Join Denise and the other FDSA instructors for three action-packed days of Pocket Hand Heeling, Toy Play, and Obedience, in lectures, labs, and more! Denise is presenting at FDSA Training Camp 2019, presenting at least twice each day. Welcome from Denise and announcement of this year’s camp theme! Pocket hand is a way of teaching heeling that allows your dog to use the angle and position of your hand to develop and maintain an exceptionally precise heel position. You’ve heard people talking about “pocket hand” for heeling, and now you get to see it in action! This technique will work just as well for retraining a 10-year-old dog as starting an eight week old puppy. If you’d like to learn more about using pocket hand, join Denise in this lecture and lab and have your dog heeling with finesse in no time! This lab will help you develop excellent toy play with your dog. Denise will introduce both the mechanics and the qualities of the dog-human interaction that can make toy play either highly enjoyable for both parties or an absolute misery. Toy play is not simple! It is fascinating and complex and subtle and, best of all, it can be learned! Whether your dog shows absolutely no interest in toys or is a rabid tugger who simply refuses to return to re-engage, Denise can improve your game. Ring readiness isn’t just about the exercises. It includes getting into the ring, setting up and waiting for the judge, moving between exercises, handling the loss of food and toys in competition and a plan for leaving the ring. In this lab, each team will complete a formal “run through” for the individual Novice or Open exercises. However, the focus of Denise’s feedback will not be the actual exercises; instead she will focus on the un-judged elements that can make or break a team’s run. For example, Denise might comment on the need for more connection entering the ring, along with some simple ways to get it, rather than providing advice on improving the team’s heeling skills. This lab is appropriate for teams that are close to being ready to compete at either the Novice or Open Level. Most sport training for competition dogs is focused on getting behaviors and preparing to trial. By using food, toys and personal play, we can convince our dogs that working with us is a lot of fun! And this is perfect…. until it’s not. It’s time for you to stand back and let your dog push you! Push you to train. Push you to work. Push you to bring out the food and toys. Engagement training is the process of moving responsibility for work from the human to the dog. No more begging. No more bribing. A simple and respectful way to engage your dog. A dog that understands engagement will take opportunities to work when they arise and will remain focused and engaged throughout the session. Having a problem with an Obedience exercise or part of an Obedience exercise? In this session, Denise will address any Obedience handling or training issues that you might have. Your dog plays with toys…awesome! Now you need some help with a few details. Maybe you can’t get your toy back. Maybe your dog is careless of your fingers or maybe…maybe it’s all pretty much perfect but you’re not sure how to add some work to the play. This is the perfect lab if you have toy play but you’re looking for…more! If you need some refinement with the toy play itself or if you feel great about all aspects of your play but you’d like some direction incorporating that play into work, then this is the lab for you. Denise will share some closing remarks, and will announce next year’s date and location! For more information, or to register, please visit www.fenzidogsportsacademy.com.